Parma Pizza | Time to Cook! I love brick oven pizza – the crust is so light and crunchy and the toppings take center stage. When I saw this recipe in the Wall St. Journal for making pizzas at home, I thought it would be fun to try. This is not an easy weeknight dinner, but this is doable over the weekend (and can be a fun “hands-on” dinner party idea) – and best of all, you can make parts of it ahead of time. You can make the sauce up to 4 days ahead, the dough up to 3 days ahead (or frozen up to a month ahead), and the rest is easy. Two quick notes — 1) take the fresh mozzarella out of its liquid the day before you make your pizzas so it doesn’t soak your pizzas and 2) the dough might need a bit more cold water when mixing (up to 1/2 cup). I did not have a pizza stone and my pizzas turned out just fine. You will be amazed at how good these artisanal pizzas are – made in your own kitchen! Marc Vetri’s simple recipe produces a hearty-yet-thin Roman-style crust that is easy to execute at home. Makes 6-7 12-inch rounds. 1. Put flour, sugar, oil and 1½ cups plus 2 tablespoons cold water in bowl of a stand mixer. Crumble in yeast. Using dough hook, mix on low speed until everything is moist, about 4 minutes, scraping bowl as needed with a rubber spatula. Increase mixer speed to medium and mix until dough clings to dough hook, about 4 minutes. Add salt and mix until dough is very soft and stretchy, another 3 minutes. 2. Cut dough into 6 or 7 equal pieces and roll into balls (about the size of a softball) on unfloured board. Arrange balls on baking sheet and scatter a little flour on top of dough. Cover entire sheet with plastic wrap and refrigerate overnight. 3. Remove dough from refrigerator and let stand at room temperature for 1 hour. Working one at a time, flatten ball on a floured work surface. Hold disk in the air and circle your fingers around the edge, pinching gently around the edge to make a border. It’s easier to start stretching dough in the air instead of on a work surface, because gravity will pull and stretch it. Once it’s about 8 inches in diameter, place dough on floured work surface and pat it out with your fingertips, from the center toward the edge, to fully stretch. Gently push your palms into center of the dough to stretch it toward the edges. Pat and stretch to a round about 12 inches in diameter and 1/8-¼ inch thick. Top as you like and bake. Make ahead: Cover and refrigerate dough for up to 3 days or freeze in an airtight container for up to 1 month. Thaw and bring to room temperature before rolling out. Don’t skimp here. Since this base has only four components, flavorful tomatoes, quality oil and fresh herbs make the difference between a so-so and a sublime sauce. Makes about 2½ cups, about 4 pizzas’ worth. Purée everything with an immersion or upright blender. Taste and adjust seasoning. Make ahead: You can refrigerate the sauce in an airtight container for up to 4 days. • Remove all but the bottom rack in your oven. Set baking stone on remaining rack. • Preheat oven to 500 degrees for at least 30 minutes before baking. If you have convection, turn it on to help brown and blister the bottom of the pizza. • Place dough on a well-floured rimless baking sheet. Ladle 2/3 cup sauce into the center of the dough round, then spread from the center to the edges by moving the ladle in widening concentric circles. • When recipe calls for fresh mozzarella, slice cheese into 2½-inch-thick rounds, then break each up into 2 pieces and scatter over pizza. Piled with arugula and slices of salty prosciutto, this pie is like the love child of a pizza and a salad. Scatter ½ cup cubed fresh mozzarella and ½ cup cubed fontina cheese on dough. Bake on pizza stone at 500 degrees until crisp. Mix together 2 cups arugula, 1 tablespoon extra-virgin olive oil, 1 teaspoon Sherry vinegar and salt and pepper, to taste. 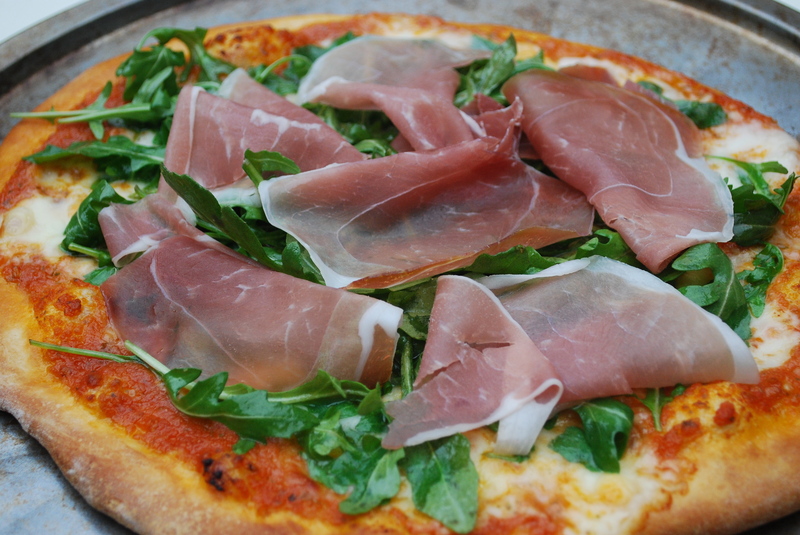 When pizza comes out of oven, put arugula mixture on top and garnish with 4 thin slices of prosciutto.